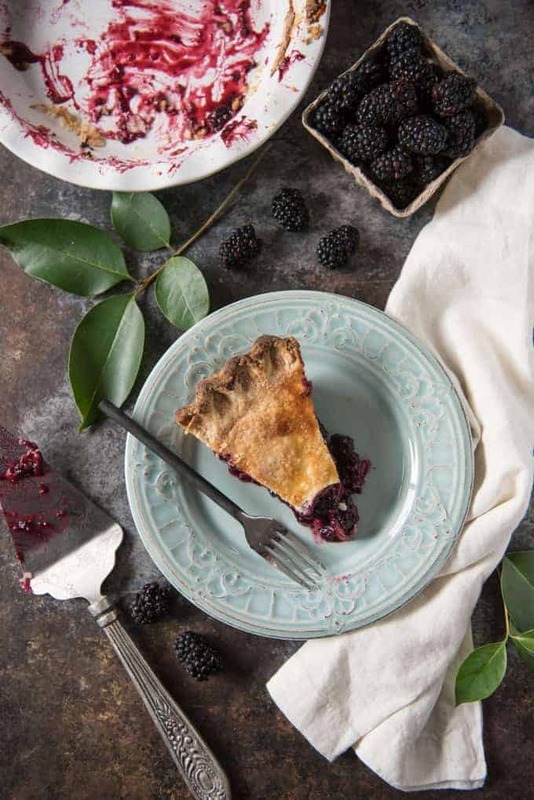 Filled with huge, sweet blackberries bursting with juice and baked in the most perfect, flaky, buttery pie crust, Homemade Blackberry Pie is as good to eat as it is to look at. 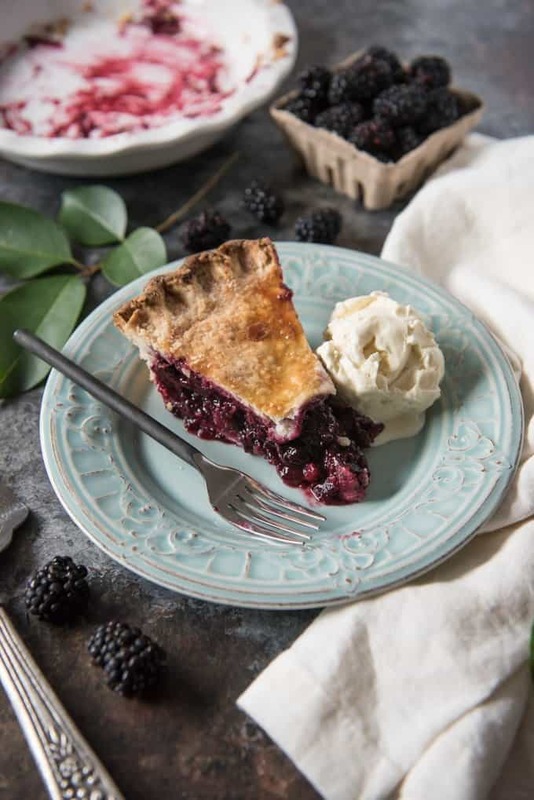 Your friends and family are going to love you if you show up with a fresh, Homemade Blackberry Pie to share! Can I just admit that for YEARS blackberry pie has been my white whale? 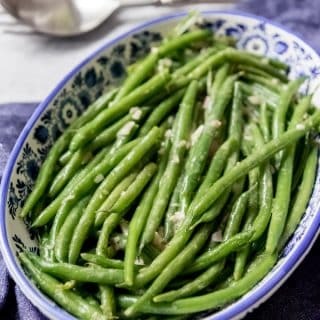 Every recipe post I could find made it sound so easy to make, but mine always turned out runny! 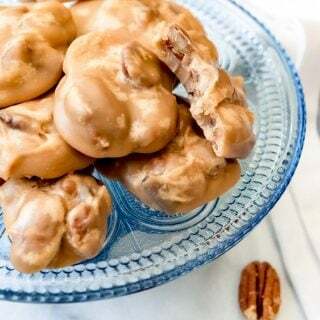 Or I would overshoot the mark and add too much of a thickening agent to compensate for previous attempts and end up with a filling that was gummy. It was so frustrating! But I kept trying for blackberry pie success because it is my hands down absolute favorite pie. And it was totally worth it because this homemade blackberry pie is incredible and so, so simple! And when it comes to Thanksgiving and pies, this is the one I always go for first before any other. When blackberries are in season, like they are right now, they are unbelievably good. We have been to our local farmer’s market the past two Saturdays in a row just to buy multiple flats of them and have a hard time setting aside enough fresh berries to do anything with them because we keep popping the giant, juicy berries right into our mouths. If you can keep some set aside in reserve, they will make an incredible pie. 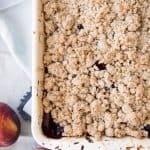 Or you could always used them in a crumble like this Blackberry Nectarine Crumble. But the good news is that frozen blackberries work just as well as fresh in this pie, so long as you use a couple little tricks to account for the freezing and then defrosting process. See, the reason I have had problems with homemade blackberry pie in the past is that most recipes just say to use fresh or frozen blackberries like they are totally interchangeable. 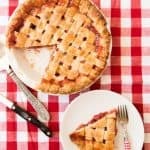 But in my experience, if you take your blackberries straight from the freezer, toss them with the rest of the filling ingredients and dump them into your pie crust, you will end up with a soggy, juicy mess of a pie that, while still delicious, won’t set up properly the way it’s supposed to. The method I am going to share today solves that problem. 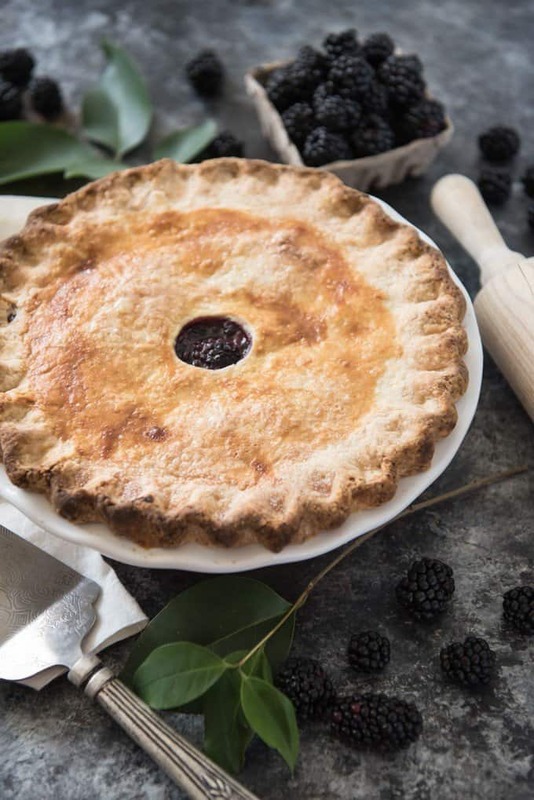 If you are using fresh blackberries, then it’s no big deal, just toss the filling ingredients together and put them in the pie crust, easy-peasy. If you are using frozen blackberries, however, you are going to want to pull them out of the freezer ahead of time and let them thaw. But instead of just tossing that beautiful, dark purple juice, drain it into a microwave safe bowl and whisk in 1/2 tablespoon of the cornstarch called for in the recipe along with 1 tablespoon of sugar and microwave it for 45-60 seconds until it thickens up. Then toss your thawed blackberries with the remaining cornstarch, sugar, and lemon juice and gently stir in the thickened blackberry juice mixture. Before pouring all of that into your uncooked pie crust, brush part of your egg wash on the bottom crust, which will create just enough of a seal to let the crust cook through on the bottom all the way without getting soggy from the juicy berries. Then once the pie is cooked, let it cool completely so that the berry filling has time to set before slicing into the pie. You can always reheat it just a bit if you like eating your pie warm. These steps are simple but they will save you the heartache of cutting into a beautiful looking pie only to have it fall completely apart because the filling is soupy. You are going to need a top and bottom pie crust for this pie. I recommend this perfect pie crust recipe that I use in all my pies like this Salted Caramel Apple Pie. It turns out amazing every time thanks to both butter for flavor and shortening for a tender, flaky crust. I love doing lattice crusts on pie, but when it comes to homemade blackberry pie, there is just something about a solid top crust with only one hole cut out from the center with a small biscuit cutter and a sprinkle of granulated sugar over the egg wash that really speaks to me. It sets it apart from other pies and distinguishes it without being fussy or pretentious. And it gives a peek at the luscious, dark purple inside of the pie while it’s baking. It makes me think of country farms and hoe-downs and pies cooling on windowsills. Which makes me think of that scene from the musical “Oklahoma” where Laurey and Gertie (the one with the ridiculous laugh) are boasting about their pie crusts being so light and flaky. Do you know the scene I’m talking about? Laurey (the heroine) brags to rival Gertie (who is going to the dance with the cowboy hero, Curly) that her pie crust is so flaky that “she just touched it and it broke into a million pieces!” I don’t know why but that line has always stuck with me and it cracks me up. I love old musicals. You really ought to make this pie and then put on Oklahoma. Sounds like a perfect idea to me. I’m not going to make any ridiculous claims about the flakiness of the crust, but I will say that this blackberry pie definitely won’t disappoint. 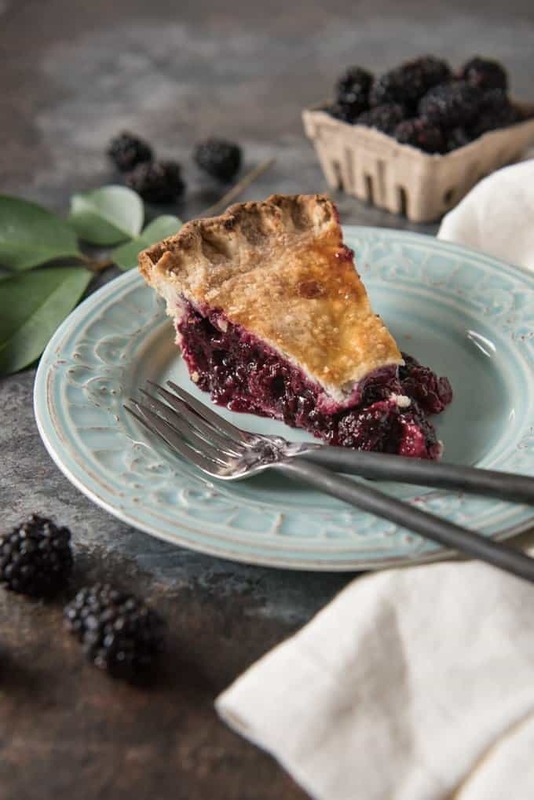 Filled with huge, sweet blackberries bursting with juice and baked in the most perfect, flaky, buttery pie crust, Homemade Blackberry Pie is as good to eat as it is to look at! Stir together the flour, sugar, and salt. Using a pastry cutter or a food processor (if I had one I would use it! ), cut the shortening and butter into the flour until the mixture resembles coarse crumbs. 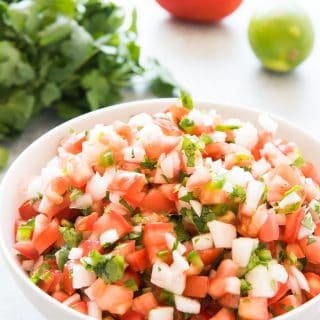 It is only about 10 pulses with a food processor but a bit more work by hand. One trick to make the process a little easier is to freeze your butter beforehand, then grate it into the flour mixture before cutting it in with the pastry cutter if not using a food processor. Sprinkle 2 tablespoons of the ice water over the mixture. 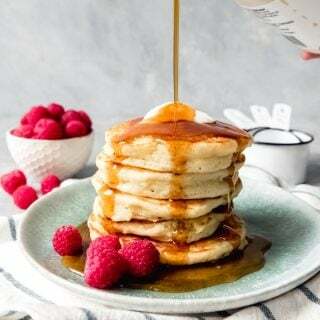 Using a fork, gently stir the water in to the flour mixture, then repeat with the remaining water, adding only 2 tablespoons at a time, just until the dough starts to come together. Divide the dough into two even pieces. Turn each piece of dough onto a sheet of plastic wrap and flatten each into a disc and wrap tightly in plastic wrap. Refrigerate for 1 hour, then allow the chilled dough to sit on the counter to soften slightly for 10 minutes before rolling out. Roll out and the bottom crust. Gently line a pie plate with bottom crust and brush with part of the egg wash before adding blackberry filling. To prepare blackberry filling, in a large bowl, add blackberries, sugar, cornstarch and lemon juice and gently toss to combine. Pour filling into the prepared pie crust. Roll out top pie crust and cut a circular hole in the center with a small biscuit or cookie cutter, then gently lay the crust on top of the blackberry filling. Trim edges of the pie dough and crimp in a decorative pattern. If desired, you could do a lattice crust or other decorative top. Brush the top crust with remaining egg wash and sprinkle with 1-2 tablespoons of sugar. Bake for 45-60 minutes, until the filling is thick and bubbly and the crust is golden brown. If the edges of the crust begin to get too dark too soon, cover them with tin foil or use a pie guard so that they don't burn while the rest of the pie continues to bake. When the pie is done, remove from the oven and allow the pie to cool for at least 2-3 hours before serving so the filling can continue to set up. *If using frozen blackberries, allow the berries to thaw first in a large bowl, then pour the juice into a medium microwave-safe bowl. Add 1 tablespoon of the sugar and 1/2 tablespoon of the cornstarch and whisk to combine. 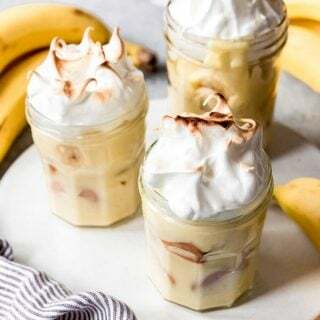 Microwave the juice, sugar, and cornstarch mixture for 30-60 seconds, until thickened. Set aside while you combine the defrosted blackberries, sugar, cornstarch and lemon juice and toss to combine, then gently stir in the thickened blackberry juice. This pie sounds heavenly! And the photos are gorgeous, too! What a gorgeous pie! 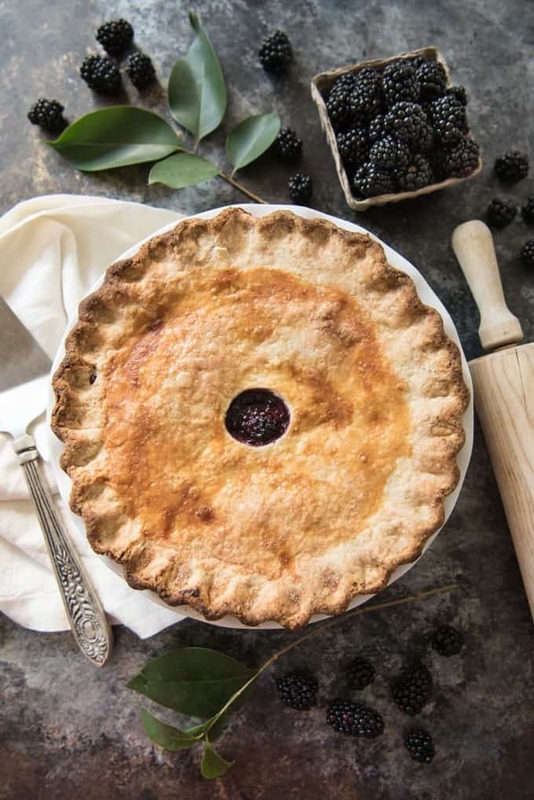 I love blackberries and when they are in season I buy as many from the farmers as I can and freeze them so I can make great pies like this one! Such a great idea, Jennifer! We love to pick them ourselves, too, when we get the chance! That is a gorgeous pie! I love a good blackberry pie and yours look and sound spectacular. Thank you, Nicoletta! It’s one of my favorites too! What a gorgeous pie! Your tip for making frozen berries work in pies make me excited because I generally only make pie during the summer when all of the fruit is in season. I miss it during the winter and almost always have frozen fruit on hand for smoothies. Oh you should definitely give it a try then, Jenna! I don’t feel like it works quite as well for blueberries, but for blackberries or raspberries this method is great! Beautiful, Amy! Oh, this tugs at my heartstrings. We always had an abundance of berries on the farm I grew up on and my mother used to make the most AMAZING berry pies. 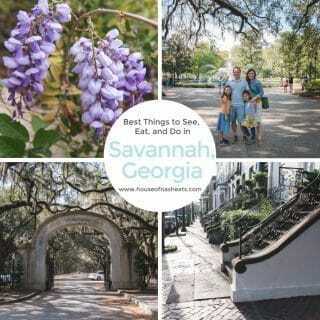 Thanks for sharing and your photography is gorgeous! Thank you, Carol! That sounds like heaven to have loads of fresh berries! Fantastic trick for frozen berries, Even if I have berries in my garden, I like to keep a bag of frozen berries in the freezer during the winter, You will never know what you fancy in a rainy day. Thank you for your thoughtful comment LG! 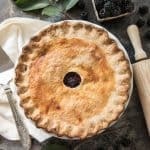 Runny pies from frozen berries really are a problem that I was trying to address with this recipe so I appreciate you taking the time to share your advice! I’m going to edit the recipe with an asterisk after “frozen” to lead down to the footnote in hopes to help others avoid tossing completely frozen berries right into their crusts! I love blackberry pie! I have to make one with the first big harvest off our berry patch each year. Sooooo good! The pie looks both beautiful and delicious! I was wanting to ask your permission to use this recipe in a school project. 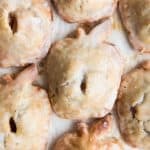 We have to “build a city” and have a main attraction, ours is a pie shop, and we love this recipe and would like to use it for the “best selling pie”. Thanks. Also cant wait to try my hand at baking this! I see none of these people actually tried the recipe.I did. I had to tell my guests that they were eating desert out of a glass, because it s a par-fey slurrpy. I’m sorry this didn’t work out for you! Did you let it cool completely? Because like many berry pies, this doesn’t set all the way until the pie is fully cooled. One of the reasons I wanted to share this recipe is because I had problems with runny berries pies in the past myself and finally figured out how to make it without it turning out all soupy, so I’m sorry that yours didn’t set up all the way! I’ve made this dozens of times now and it comes out great each time! I just made the best pie crust ever (and I’ve been making pie for decades) using your the Double-Crust Pie Crust recipe for blackberry pie! I used the egg wash and sugar on the top crust, and it is flaky and beautiful! I used frozen Pacific Northwest little wild mountain blackberries (Rubus ursinus that my husband and I picked by our cabin on the Hoh River – they have an amazing flavor! The pie hasn’t cooled yet, but I hope that following your recipe will make the pie less runny than it usually is. However, I couldn’t wait to tell you how excited I am about the crust recipe! Thank you! I’m so thrilled that the crust worked out well for you! That makes me so happy to hear! Ugh! I made this pie tonight and while it’s absolutely delicious.. it was SO runny! I poured about 1/2 cup of juice out of the pie after cutting the first piece. I followed the directions and allowed it to cool for 3.5 hours. I wonder why it turned out this way?? Oh no! I have no idea why that would have happened as I wrote this recipe specifically to avoid that and it has worked for me every time since I figured out I needed to fully defrost the berries and microwave the juices with cornstarch to thicken before filling the pie. Have you tried it using fresh berries? I used fresh so I skipped the frozen berry note. Maybe I’ll try it again with frozen sometime. Hubby said that was the best pie crust he’s ever eaten and I had to agree! SO GOOD! I have made this pie a few times now, each time using our garden blackberries, frozen. Our blackberries are quite large, averaging a bit larger than a quarter coin. As such, they do not nicely fill a cup measure, so I end up using seven overfilled cups to get enough for a good pie. 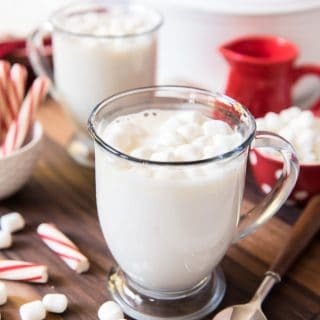 I also increase the sugar by 2-3 tablespoons to add sweetness. This seems to work for me, and I appreciate that you have given direction for using frozen blackberries. When they are in season, it is not unusual for me to pick two quarts from our bush each day, so freezing them is a must! I made this pie the other night and followed the instructions to the T, using 1 bag of frozen berries and 2 pints of fresh. I boiled the juice of the thawed berries with the sugar and cornstarch as directed and added this at the end. This pie, although delicious, was still runny. I will make it again but will boil all the berries with the sugar and cornstarch FIRST. Then add to the pie. I do this with frozen blueberries and never have a runny pie. My husband loved it, it was easy to make and we are now searching for local places that sell fresh berries! We never have enough on our property for a pie as our dogs eat them off the bushes as soon as they start to ripen!